Several friends have asked about the Jim Denevan feast that was our 40th anniversary present from Kate and my parents. I'll ignore chronology on our California trip and start with that. For those who haven't already heard the background to this gift, Jim Denevan is a talented sand artist whose astonishing beach designs featured in Michael's book. Despite international recognition, this pursuit doesn't enable even a laid-back surfer to meet expenses, so he follows another passion, cooking. For about ten years now, he has organized a series of open-air meals for 100+ people at organic farms throughout the US, with recent incursions into Europe. We had mentioned this casually to Kate, and purchased his new cookbook to await our arrival in the States. Always attuned to opportunities for the brilliant gifts that have become her trademark, Kate signed up to his Outstanding in the Field website, so that she could be informed immediately when the instant sell-out tickets became available. And she pulled it off: two tickets for the Santa Cruz feast on May 31st. All we had to do was show up at the Everett Family Farm in Soquel at 4 p.m.
Plus one other thing. A large box arrived when we were in Lansdale, addressed to Kate and postmarked Oregon. Phoning in from somewhere on tour, she instructed us to open it. Inside were the two extraordinary handmade red and black glass plates that you'll see in the photos of our dinner. Turns out Outstanding in the Field has a tradition that guests bring their own plates, which are then washed and returned at the end of the evening. So our other responsibility was to get the plates safely to the farm. Which, hand carrying them in lots of bubblewrap, we did. Ours were definitely the showstoppers that evening. After a chilly overnight in Berkeley, we arrived at Soquel's Apple Lane Inn in bright sunshine. Taking a few minutes to gaze at the pressed tin ceiling in the converted Victorian bathroom that was our room--and to admire Uncle Chester's 250-year-old hand-carved, solid mahogany bed, brought to California from Spain via New Orleans--we headed off on our gastronomic adventure. In previous years, weather for the event had sometimes been too cold and damp or far too hot, but we were in the Goldilocks zone, just right. First, all the guests milled around the farm shop where you could buy lavender and various comestibles. Plates of crostini were served, piled high with roasted summer squash, smoked chevre and mint or ciccioli (an incredibly flavorful pork paste--we had never heard of it either, though I expect Paola will have), radishes and mustard. Delectable mouthfuls, I assure you, but I neglected to get a photo. The shot I do have, however, is of Michael and Jim Denevan enjoying the 2007 Bonny Doon Pommeau that was served with the hors d'oeuvres. All wines that evening came from Randall Grahm's Santa Cruz vineyard. We were then divided into groups and taken on a tour of the farm, through the orchards and past the 300 well-groomed hens in the chicken coop. Below is Laura Everett, who runs the farm with her husband. She's the offspring of a Napa Valley wine family, so even though she rises at something like 5 a.m. each day to check the gopher traps, you don't get the impression they're too worried about money. And here I am, waiting for the seats around us to be filled by what turned out to be several pairs of friendly Californians--another key ingredient in the recipe for a memorable day. Our first course, a salad of grilled farm strawberries [we tried this at home--strawberries got a bit mushy but barbecued mangoes were delicious], beets, farm greens, and pecorino. Next course, roasted squid (by far the best, most tender calamari I've ever eaten) in a fish broth over chickpeas, arugula and mizuna. Roast lamb from Don Watson's ranch in Napa Valley, with fork-smashed peas, smoked root vegetables, cigare jus (which I assume is meat juices plus the 2004 Le Cigare Volant that was poured for this course). This carnivore's delight caused great hilarity at the table. A charming young vegetarian (photo 1, below) was sitting opposite Michael. She was induced to try her first taste of lamb and, unfortunately for her principles, loved it. Jeremy, a surfer and school principal (photo 2, tucking into his bone with fine caveman spirit), spotted a "tattoo" near where her piece of meat had come from. Michael, always one to rise to this sort of occasion, told her that the poor little lamb's tattoo read, "I LOVE YOU, MOMMY." Surprisingly, since I'm not generally a lover of those tiny green spheres, the "fork-smashed peas" were one of my favorite parts of the whole meal. As the wine flowed and our inhibitions lessened, I listened to my husband and used my finger to clean the plate--something I do at home regularly but only absent-mindedly in polite company. For dessert -- poppy seed and lemon thyme tea cake, bing cherries macerated in Calvadoon (Randall Grahm's typically whimsical name for his Calvados-like liqueur), and a vanilla cream with the inspired addition of soft goat cheese. The vin doux was 2007 Angel Paille. 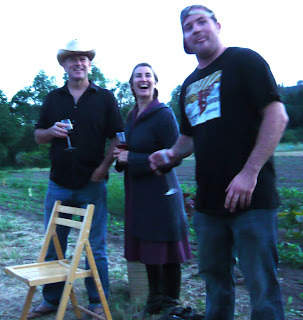 Lorry, the medical professor, sitting across from his artist wife, Karen, stole some strawberries from the field behind the table; he's pictured in the second photo sharing them with Jeremy and his wife, Cassandra. These Californians, as I said earlier, were critical to the success of the meal. You can't help wondering if any other state or country would provide the same rollicking, casual sense of bonhomie. In keeping with the whole tenor of the occasion, the last photo, as shadows were lengthening, shows the head chef, Charlie Parker, in baseball cap and t-shirt. He may run the upmarket Cellar Door Café at the Bonny Doon Vineyard, but he looks as if he could be on tour with Kate. Final note: part of the cost of this extravagantly generous gift was channeled to the organic farming program at UC Santa Cruz.